JERUSALEM—Knife-wielding terrorists are proof that Israel’s security fence saves thousands of both Israeli and Palestinian lives, the fence’s creator, Danny Tirza, tells Breitbart News. He also remarks that Barack Obama did not understand the need for Israel’s security system when he spoke with him several years ago. Mainstream media sources castigate Israel for creating a security barrier between the Jewish State and the West Bank, the name for the massive area—in one place 31 miles wide—that Israel has relinquished to the control of the Palestinian Authority. American news reports typically refer to it as a “wall,” which leftist commentators often compare to the infamous Berlin Wall. 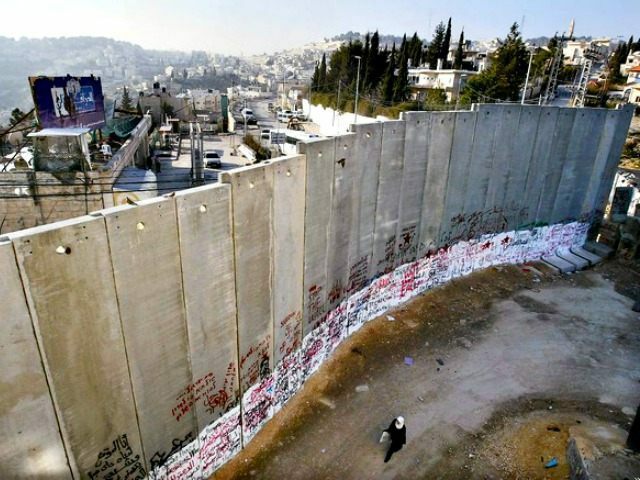 The wall was designed by Tirza, who recently retired as a colonel in the Israeli Defense Force (IDF). For years, he traveled the entire length of the “green line” border where Palestinian political control begins, supervising the construction of the wall. He now gives detailed briefings with large maps showing the location of the fence throughout that part of Israel. Tirza explains that his penchant for visual aids led to deceased Palestinian Authority leader Yasser Arafat giving him the name “Abu Harita,” which means the “Father of Maps.” But, he adds with smile, in Arabic it sounds very similar to “Father of B.S.,” and quips that it’s no coincidence that Arafat assigned him this moniker. In reality, the barrier is mostly a fence, not a wall. The barrier’s planned length is approximately 450 miles, over 80 percent of which has been built. But only 5 percent is wall, while the other 95 percent is fence. And there are a number of checkpoints along the wall where individuals can pass freely both ways, but where Israeli soldiers are able to stop suicide bombers. Israel keeps a short space on both sides of the fence completely clear of bushes or debris, so that cameras—both normal and night vision—can maintain a clear view of the fence. Special Israeli vehicles sweep the ground twice per day on the Israeli side to maintain a clear view, and to enable Israeli patrols to find the prints of any potential attackers who make it over the barrier. Countless cameras are deployed along the fence, along with heat sensors, motion sensors, and metal detectors, which coupled with the sensors enable Israeli patrols to detect any breaches. Beyond those, underground seismic sensors are on the lookout for men digging tunnels under the wall. Around Jerusalem, IDF patrols are arranged in such a way that with the road on the Israeli side of the fence, armed soldiers can reach any point along that route within five minutes. The numbers bear out the effectiveness of the security fence. According to Tirza, between 2000 and 2006, there were 4,000 terrorist attacks in Israel, resulting in the deaths of 1,639 Israelis. In stark contrast to those statistics, from 2007 through the present in 2015, there have only been 32 suicide-bomb attacks, and only 20 Israelis have died. The construction of the wall was done in consultation with interested groups all over the world. These included not only Palestinian groups, but also delegations from the Vatican to the White House. He tells the story of when Condoleezza Rice called from the administration of President George W. Bush, telling him that the fence route would have to be moved because it would divide the soccer field at Al Quds University, an Arab institution of higher learning situated in the greater Jerusalem area. Tirza found no such field, and went to the head of the university asking for its location. The university president confirmed that no soccer field existed, but noted that there was an agricultural field where the students played soccer and hoped one day to construct a playing field. Tirza changed the route of the fence to accommodate the students’ soccer and the White House’s concerns. For Tirza, what’s the bottom line? When you’re trying to control who enters your nation or territory, fences and walls work, if they’re done the right way. He is immensely pleased that there are almost no casualties for either population from attacks that the fence is designed to prevent. But he’s saddened by how many in the media around the world—including many in the American press—describe the barrier in terms that make it sound repressive or as a tool to deny rights to the Palestinian people. The wall is designed to provide safety for people on both sides, he explains. He added that he regularly briefs foreign leaders on the fence, and remembered showing the area to then-Sen. Barack Obama. The future president criticized part of the design, noting that after the fence there is an area of perhaps a few hundred yards of empty, rough terrain before you get to Israeli shops, homes, and other buildings. “‘It seems you’re taking land that could be given to the Palestinians,’” he recalls Obama saying. Tirza responded that the reason for the empty expanse is so that once would-be terrorists breach the wall, three Israeli patrols are dispatched from different directions to intercept them, and the empty expanse gives the soldiers time to close the distance and catch the potential attacker before he can enter a populated area and carry out an attack. Ken Klukowski is legal editor for Breitbart News and is reporting on location from Israel, the West Bank, and Gaza. Follow him on Twitter @kenklukowski.